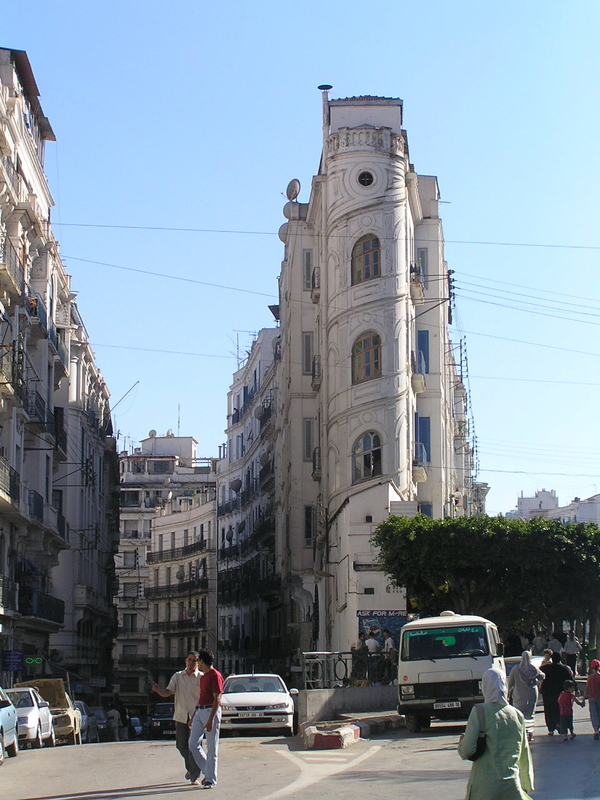 Algiers (Arabic: الجزائر al-Jazā’er, French: Alger) is the capital and largest city of Algeria. In 2011, the city's population was estimated to be around 3,500,000. An estimate puts the population of the larger metropolitan city to be around 5,000,000. 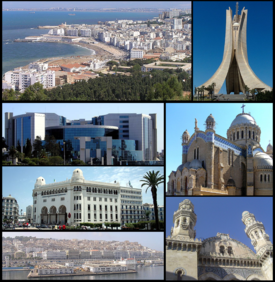 Algiers is located on the Mediterranean Sea and in the north-central portion of Algeria. The city name is derived (via French and Catalan Alger) from the Arabic name الجزائر al-Jazā’ir, which translates as "The Islands", referring to the four islands which used to lie off the city's coast until becoming part of the mainland in 1525. Al-Jazā’ir is itself a truncated form of the city's older name جزائر بني مزغانة Jaza'ir Bani Mazghana, "The Islands of the Sons of Mazghana", used by early medieval geographers such as al-Idrisi and Yaqut al-Hamawi. A Phoenician commercial outpost called Ikosim which later developed into a small Roman town called Icosium existed on what is now the marine quarter of the city. The rue de la Marine follows the lines of what used to be a Roman street. Roman cemeteries existed near Bab-el-Oued and Bab Azoun. The city was given Latin rights by Emperor Vespasian. The bishops of Icosium are mentioned as late as the 5th century. The present-day city was founded in 944 by Bologhine ibn Ziri, the founder of the Berber Zirid–Sanhaja dynasty. He had earlier (935) built his own house and a Sanhaja center at Ashir, just south of Algiers. Although his Zirid dynasty was overthrown by Roger II of Sicily in 1148, the Zirids had already lost control of Algiers to their cousins the Hammadids in 1014. The city was wrested from the Hammadids by the Almohads in 1159, and in the 13th century came under the dominion of the Ziyanid sultans of Tlemcen. Nominally part of the sultanate of Tlemcen, Algiers had a large measure of independence under amirs of its own due to Oran being the chief seaport of the Ziyanids. This article incorporates text from a publication now in the public domain: Chisholm, Hugh, ed (1911). "Algiers". Encyclopædia Britannica. 1 (11th ed.). Cambridge University Press. pp. 653–655. This article was originally based on a translation of the French Wikipedia's article of the same name. ^ "Population of the city proper according to the 2008 census". Citypopulation.de. Archived from the original on 15 June 2010. http://citypopulation.de/Algeria.html. Retrieved 2010-06-27. ^ a b "UN World Urbanization Prospects". Esa.un.org. Archived from the original on 2009-12-23. https://web.archive.org/web/20091223005931/http://esa.un.org/unup/index.asp?panel=2. Retrieved 2010-06-27. ^ Origins of Algiers by Louis Leschi, speech delivered June 16, 1941 published in El Djezair Sheets, July 1941 History of Algeria (French). ^ "Tyrkjaránið – Heimaslóð" (in is). Heimaslod.is. http://www.heimaslod.is/index.php/Tyrkjar%C3%A1ni%C3%B0. Retrieved 2010-06-27. ^ "The First Muslims in England - BBC News" (in en-GB). https://www.bbc.com/news/magazine-35843991. ^ Godfrey., Mugoti, (2009). Africa (a-z).. [Place of publication not identified]: Lulu Com. ISBN 1435728904. OCLC 946180025. https://www.worldcat.org/oclc/946180025. ^ "Les autorités accusent al-Qaïda". RFI. Archived from the original on 13 December 2007. http://www.rfi.fr/actufr/articles/096/article_60149.asp. Retrieved 2007-12-11. ^ "Toll in Algiers bombings rises to 31". Associated Press. Archived from the original on 2007-12-14. https://web.archive.org/web/20071214021257/http://news.yahoo.com/s/ap/20071212/ap_on_re_af/algeria_explosion. Retrieved 2007-12-12. ^ "Al Qaeda blamed for Algeria bombs". CNN. 2007-12-12. Archived from the original on 12 December 2007. https://web.archive.org/web/20071212153122/http://edition.cnn.com/2007/WORLD/africa/12/11/algeria.blast/index.html. Retrieved 2007-12-11. ^ "Notre Dame d’Afrique and Carmelite Convent, Algiers, Algeria". 1899. http://www.wdl.org/en/item/8766/. Retrieved 2013-09-25. ^ Balmforth, Richard (4 February 2012). "European Chill Moves West, 122 Die in Ukraine". Reuters. https://www.reuters.com/article/2012/02/04/us-europe-weather-idUSTRE8130NK20120204. ^ "World Weather Information Service–Algiers". World Meteorological Organization. http://worldweather.wmo.int/en/city.html?cityId=242. Retrieved 16 October 2016. ^ "Appendix I: Meteorological Data". Springer. http://extras.springer.com/2007/978-1-4020-4577-6/Book_Shahin_ISBN_9781402045776_Appendix.pdf. Retrieved 16 October 2016. ^ "Station Alger" (in French). Meteo Climat. http://meteo-climat-bzh.dyndns.org/index.php?page=stati&id=15. Retrieved 16 October 2016. ^ "Fountain in Mosque of El Kebir, Algiers, Algeria". 1899. http://www.wdl.org/en/item/8764/. Retrieved 2013-09-24. ^ "Algiers in the World Gazetteer". World-gazetteer.com. http://www.world-gazetteer.com/wg.php?x=&men=gadm&lng=en&dat=32&geo=-66&srt=npan&col=aohdq. Retrieved 2010-06-27. ^ "MERCER Human Resources Consulting – Moscow tops Mercer's cost of living list; London is close behind". Mercerhr.com. Archived from the original on 1 July 2010. http://www.mercerhr.com/costofliving. Retrieved 2010-06-27. ^ "HP Office locations". Welcome.hp.com. http://welcome.hp.com/gms/emea_africa/en/contact/office_locs.html. Retrieved 2010-06-27. ^ Kobori, Iwao (Conseiller aupres del'Universite des Nations Unies). "L'Algerie et moi" ( Script error). Japan-Algeria Center. Retrieved on 16 January 2015. ^ "過去に指定・認定していた在外教育施設" ( Script error). Ministry of Education, Culture, Sports, Science and Technology. Retrieved on January 15, 2015. ^ "Tram testing starts in Alger". Railway Gazette. 2010. http://www.railwaygazette.com/news/single-view/view/10/tram-testing-starts-in-alger/browse/1.html. Retrieved 2010-05-18. ^ "Anniversary of sister-city relations". KCNA. 6 January 2000. http://kcna.co.jp/item/2000/200001/news01/06.htm#3. Retrieved 3 December 2017. ^ "Sherlock, banque d'information de la Ville de Montréal". 1.ville.montreal.qc.ca. Archived from the original on 2009-02-23. https://web.archive.org/web/20090223231510/http://www11.ville.montreal.qc.ca/sherlock2/servlet/template/sherlock%2CAfficherDocumentInternet.vm/nodocument/20146%3Bjsessionid%3D24C10045060CDD0AA23BD919B260FD0F. Retrieved 2010-06-27. ^ "Lisboa – Geminações de Cidades e Vilas" (in Portuguese). Associação Nacional de Municípios Portugueses [National Association of Portuguese Municipalities]. http://www.anmp.pt/anmp/pro/mun1/gem101l0.php?cod_ent=M1100. Retrieved 2013-08-23. ^ "Acordos de Geminação, de Cooperação e/ou Amizade da Cidade de Lisboa" (in Portuguese). Camara Municipal de Lisboa. Archived from the original on 2013-10-31. https://web.archive.org/web/20131031202617/http://www.cm-lisboa.pt/municipio/relacoes-internacionais. Retrieved 2013-08-23. ^ "Friendship and cooperation agreements". Paris: Marie de Paris. Archived from the original on 2016-07-01. https://web.archive.org/web/20160701024003/http://next.paris.fr/english/paris-a-city-with-an-international-profile/international-action-cooperation/friendship-and-cooperation-agreements/rub_8139_stand_29940_port_18784. Retrieved 2016-09-10. This page uses content from the English language Wikipedia. The original content was at Algiers. The list of authors can be seen in the page history. As with this Familypedia wiki, the content of Wikipedia is available under the Creative Commons License.